Precious metals traders this week will be anticipating and reacting to the Federal Open Market Committee's meeting on Tuesday and Wednesday. Gold lost $16/oz this past week and closed at $1,643. It continues to stay in a narrow range with price resistance emerging at $1,680 and price support at $1,630. Silver gained $0.12/oz and closed at $31.69. It is stuck in a narrow range between $31.00 and $32.50. Platinum gave up $4 to close at $1,586. Palladium was the big winner for the week, with prices rising $32/oz and closing at $679. All metals are lower this morning, testing support levels. The consensus indicates that at this week's meeting, the Fed will make no substantive changes in policy – such as an increase in the Fed funds rate or a new program for bond purchases. However, that won't prevent traders from parsing the Federal Open Market Committee's (FOMC's) every word and possibly moving markets dramatically given the unnatural and exaggerated dependence the markets now have on Fed actions. Since economic data have weakened recently, don't be surprised to hear Bernanke's team reiterating that the Fed stands ready to resume Quantitative Easing (printing money to buy U.S. government debt) the moment they see the need. This won't be news to anyone who has been paying attention, but such comments would likely drive gold and silver prices higher. The number of futures market contracts is at very low levels – especially in gold. 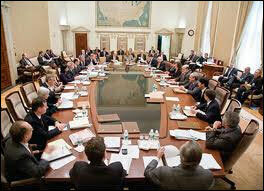 This indicates traders have lost substantial interest and are playing other markets. To counteract the decline in trading, the exchanges have reduced margin requirements for silver twice since February, and we expect similar actions in gold soon. After months of choppy price action, sentiment appears to be at a nadir – as indicated by the lack of enthusiasm among the public and advisors, as well as by the extreme underperformance of precious metals mining stocks. Premiums on physical bullion have fallen substantially, giving up a lot of the increases put in from 2010 through the summer of 2011. 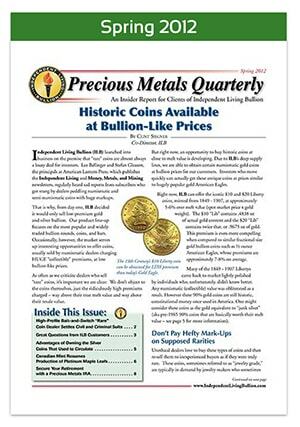 Hot off the Presses:FREE Precious Metals Quarterly Newsletter Now Available! The Spring 2012 issue of Money Metals Insider, a free newsletter published by Money Metals Exchange, is now available online. The new issue reveals a major buying opportunity in historic gold coins – now available through Money Metals Exchange at only several percentage points above melt value. "Rare" coin dealers who have been peddling these coins at 20% to 40% over the gold spot price are going to be steaming mad when they see this article! The newsletter also discusses the many advantages of owning pre-1965 U.S. silver coins – the cheapest way currently to buy silver. And it features news about the release of the new 2012 Platinum Maple Leaf. Plus, we answer several customer questions. You can access Money Metals Insider right here. We want customers to know that Money Metals Exchange is here to buy back gold, silver, platinum, and palladium in the common bullion forms. We certainly don't advocate selling at this time, as we think the bull market in metals has years left to run. However, if you decide to sell for whatever reason, we can lock a price with you right over the phone, deliver a purchase order to confirm the transaction, and send your payment promptly after we receive the metal. You will find we are as easy to deal with when you sell as we are when you buy!